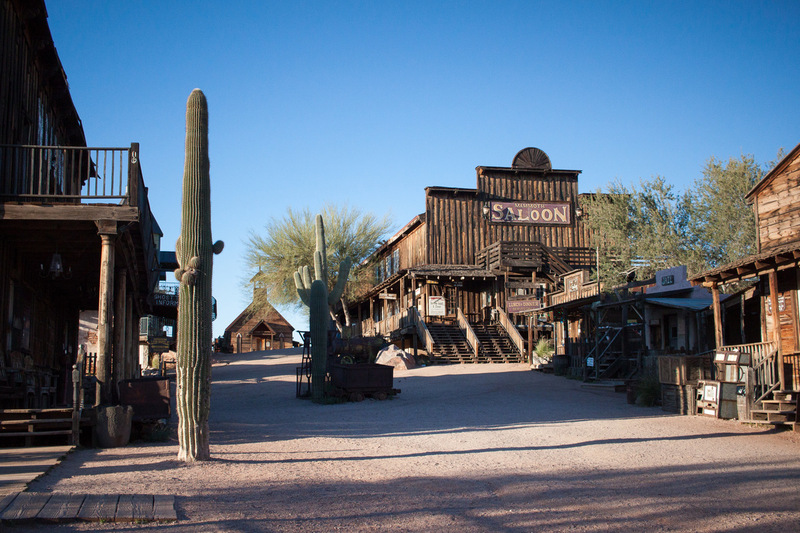 Goldfield Ghost Town is a neat tourist attraction in Apache Junction, AZ. 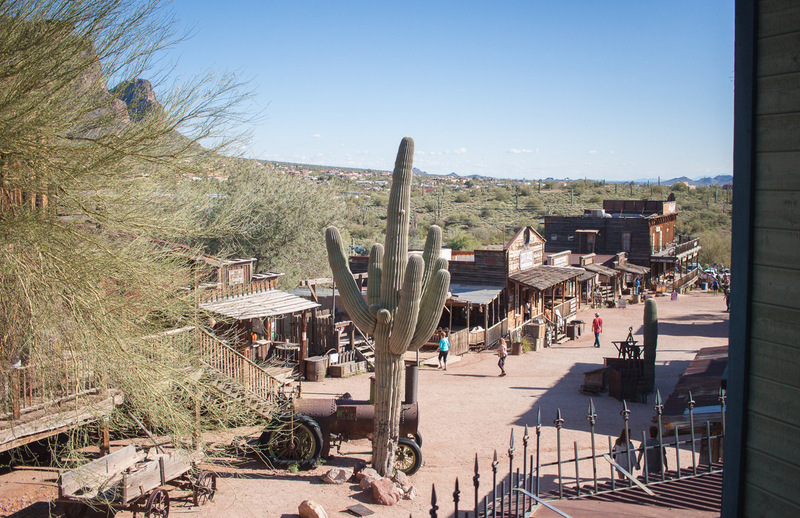 In this modern recreation of a ghost town, you can walk around and explore a dozen or so buildings, go underground on a mine tour, see a reptile exhibit which has the largest collection of snakes in Arizona, and more! You can spend the whole day here! We recommend allocating at least 4 hours if you want to do everything. Above: A view of the town from the train ride. 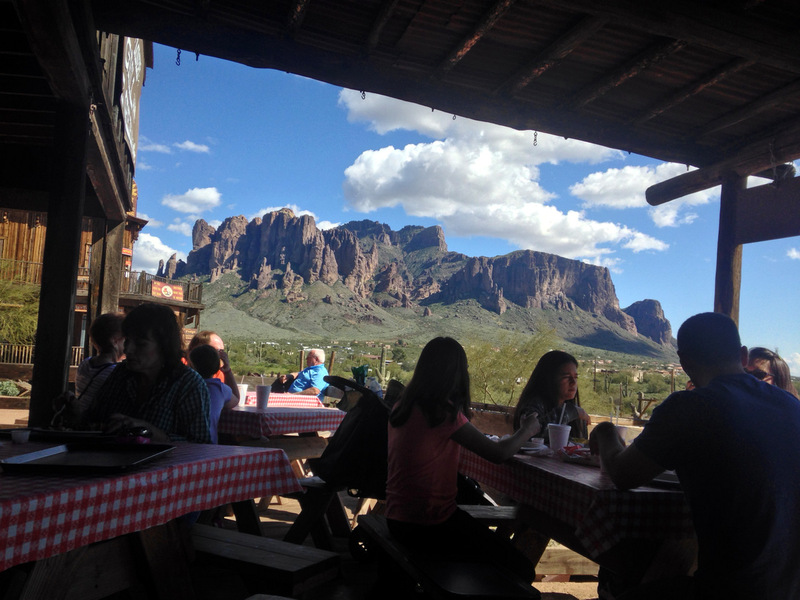 The town overlooks the beautiful Superstition Mountains and is literally 5 minutes from the Lost Dutchman State Park (great hiking place). The views will not disappoint, and you can get some absolutely beautiful sunset photos along the road. 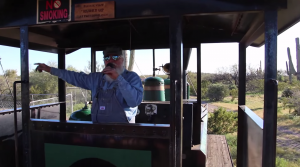 The train ride takes about twenty-minutes and completes a full circle around the town. 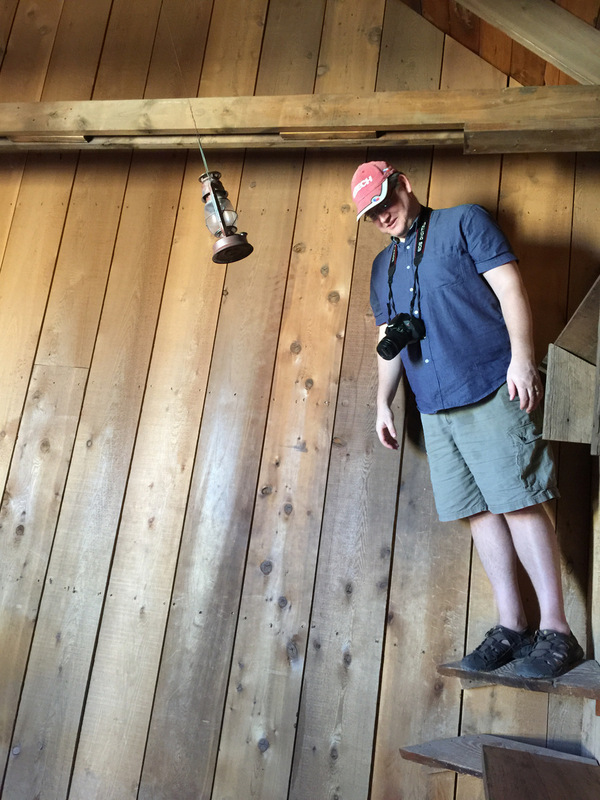 During the Goldfield train ride you are welcome to stand, walk around, and take pictures as much as you wish. Watch the train ride video. The train itself is a slow-moving old train. Which is why you can walk around during the ride. The best part of the train ride is the history. The conductor dresses the part and is extremely knowledgable about the areas history. During the train ride he told us all about the mining operations that are still ongoing in the area, as well as stories from a hundred years ago. One other thing I liked about the train ride besides the amazing view of the Superstition Mountains, were the way he conductor pointed out the various species of desert plants. The story goes that about one-hundred years ago a gold miner’s home collapsed into a huge pit, and his home was still intact except for being at an angle. Above: The author in the crazy house. The miner decided to continue living in his home, despite the fact that his home was steeply angled and lived there for another 35 years, or so. Everything in this re-created home is bazar! Since the home is angled, but the furniture is designed to be level, your perceptions are thrown off. Completely wacky experience, and lots of fun! We loved it so much we took the tour twice. Everything in the home is designed to be an optical illusion: from the pool table, to the chair in the corner, to the rolling metal balls on the wall. It’s a mystery! There are several shopping options here where you can buy souvenirs, fudge, jewelry, clothing, custom old fashioned photos, and much more. There are several places to get food, and quite good food if I might add. We ate at the restaurant overlooking the main entrance (near the parking lot) and loved the hamburgers, sandwiches, and french fries. Nearly everybody was ordering an ice cream cone, as well. There is a fancier steak house which we haven’t tried situated further up the walking path. 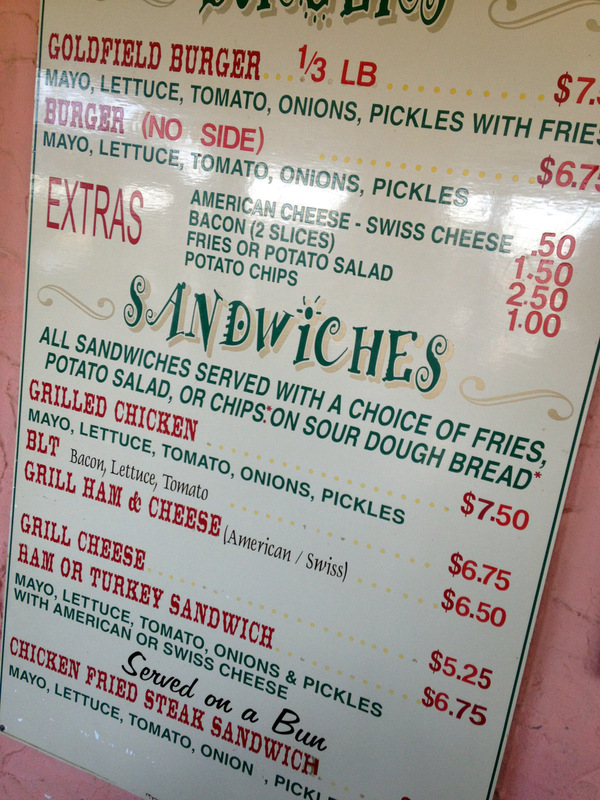 Above: The menu at the sandwich counter. Check out the view from the lunch patio! 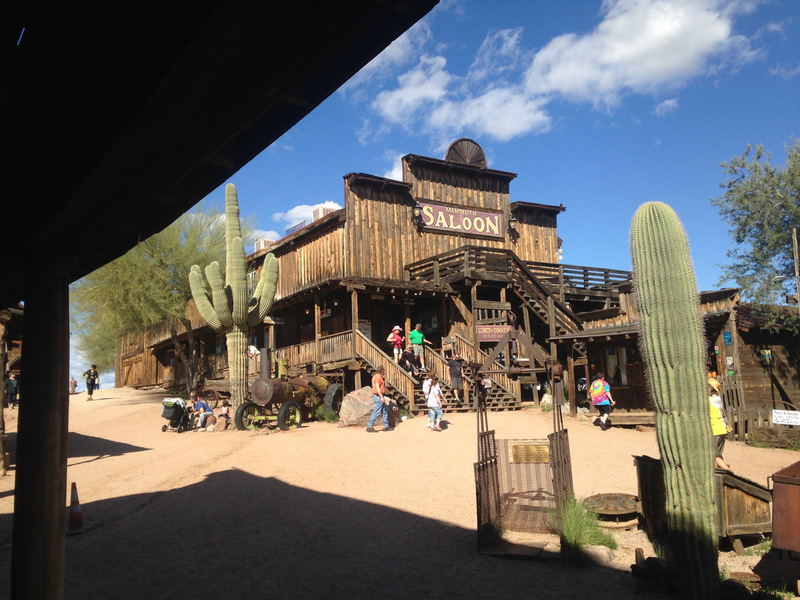 The saloon is another place where you can get lunch or dinner! This will delight the kids! So here’s how it works: You get a pan and the attendant will fill it with dirt and water. Then, you take your pan outside and swish it around and extract the gold using tweezers. 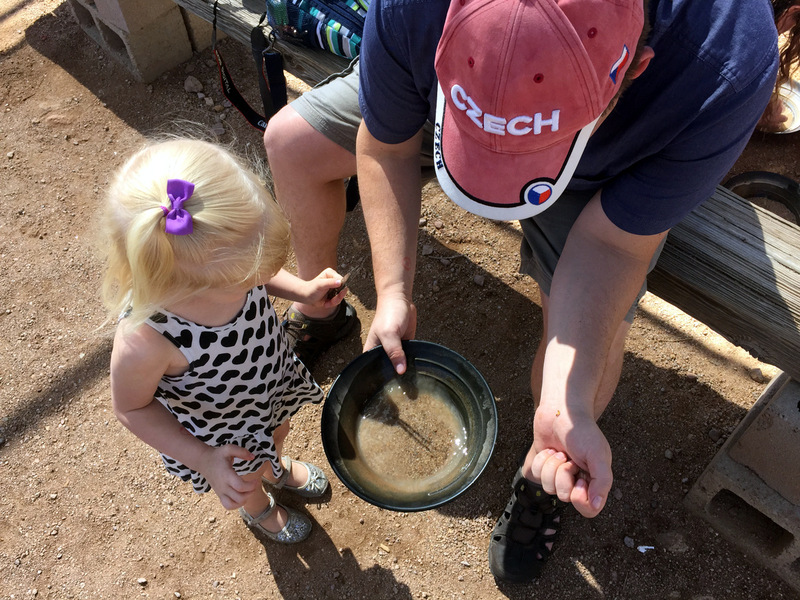 Panning for gold at Goldfield Ghost Town. I’ll tell you what’s missing from this gold panning experience? More water. Since they send you outside without the ability to dip for more water, you’re unable to pan for gold in the traditional sense. 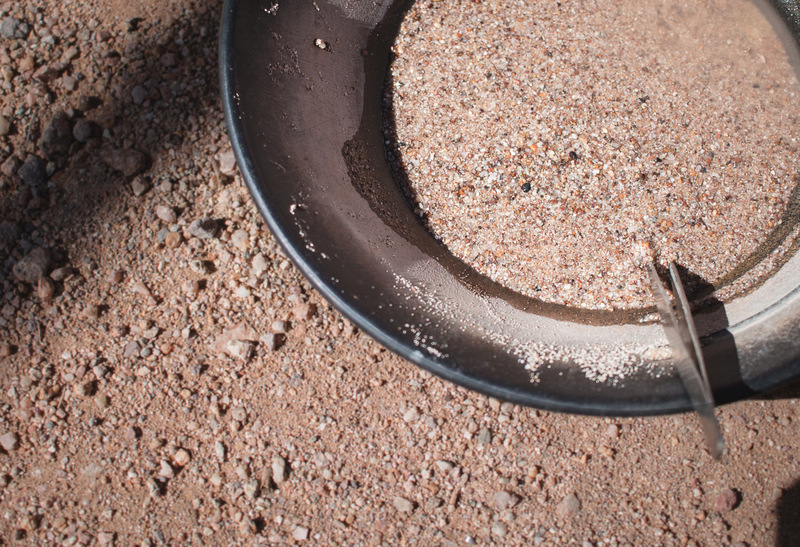 Typically, when panning for gold, you’ll swirl the pan, and continually move the dirt and water out of the pan until the gold remains. This, by far, was my favorite exhibit in the whole place. One woman owns all of the snakes and reptiles and cares for them independently. You can tell she has a huge appreciation for snakes because she has nearly every species found in Arizona on display! 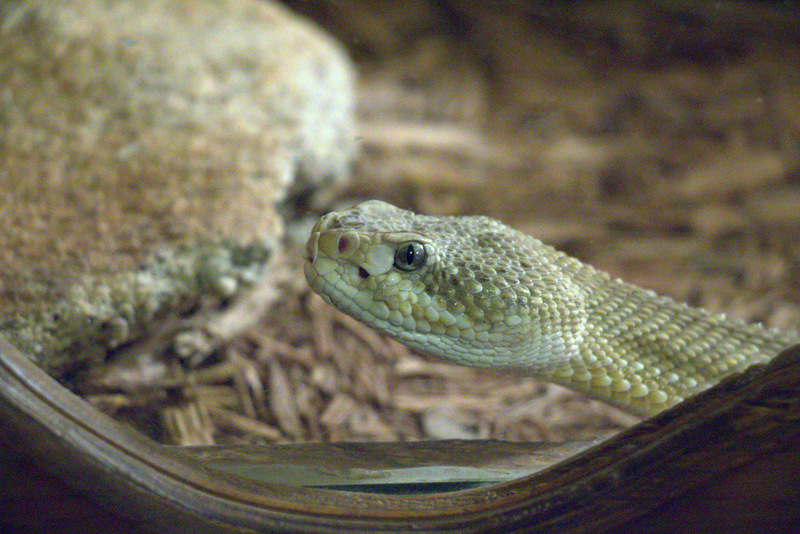 From the Arizona Diamondback to smaller less known rattlesnakes, they are all on display. She also has a few turtles, and a Gila Monster, as well as several lizard species. Snakes at the reptile exhibit. 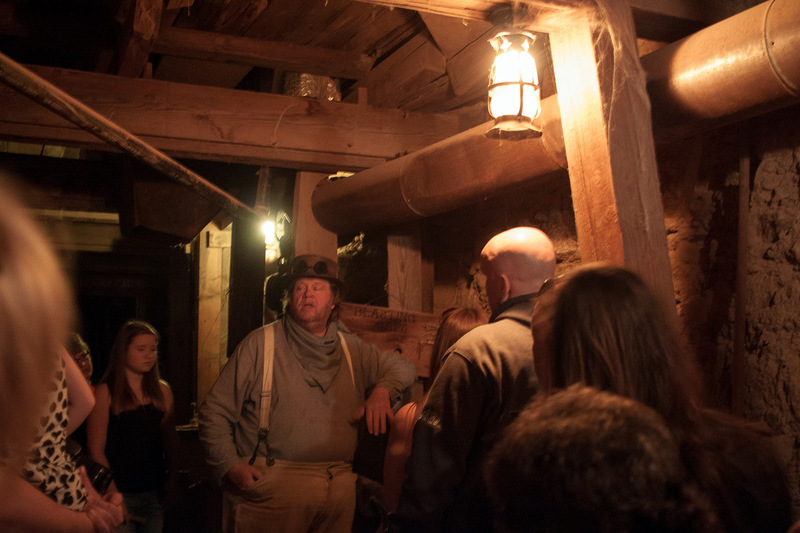 The underground mine tour explores a recreated gold mine from the 1800s. If you’ve ever been in a cave, or in a real mine, you’ll probably be slightly disappointed since this exhibit doesn’t go that far underground, and you can see the concrete they poured to build it in several places. Even so, they have lots of original mining equipment in place and the design is realistic. They turn out the lights at one point, and it is entirely dark. This area was used for mining gold more than one-hundred years ago, and the tour guide gave us quite a bit of history about the area, and about the mining operations that continue even to today. 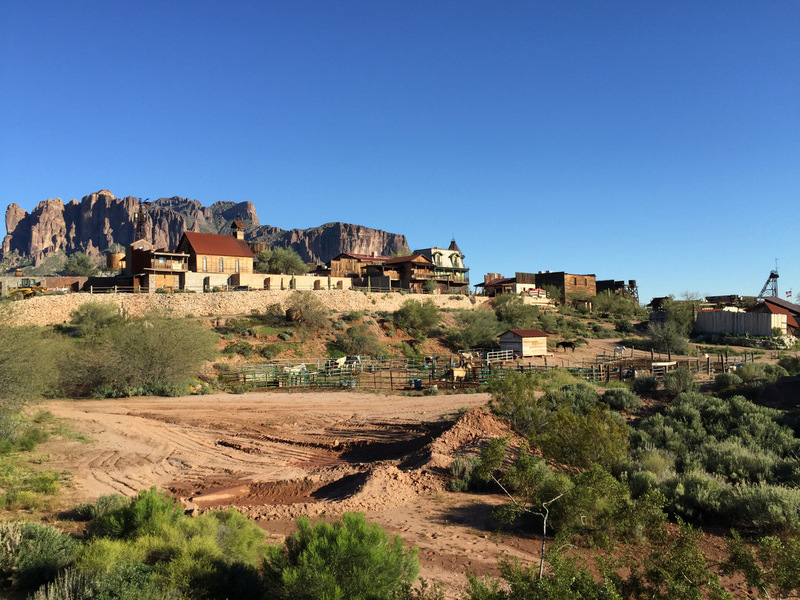 So, that’s the main parts of the Goldfield Ghost Town. There is an old hotel you can tour, as well as horseback riding, and several other shops to tour. 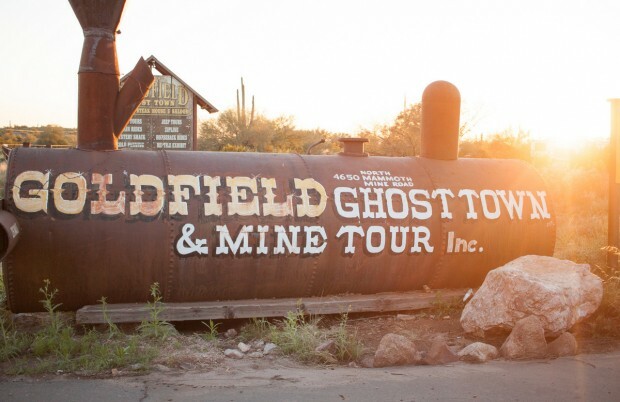 Goldfield Ghost Town is beautifully landscaped, and is free to enter and walk around. Pretty much all of the attractions cost money to view, so bring some cash. They sell an “all access pass” which we purchased for around $30. 4650 N. Mammoth Mine Rd.